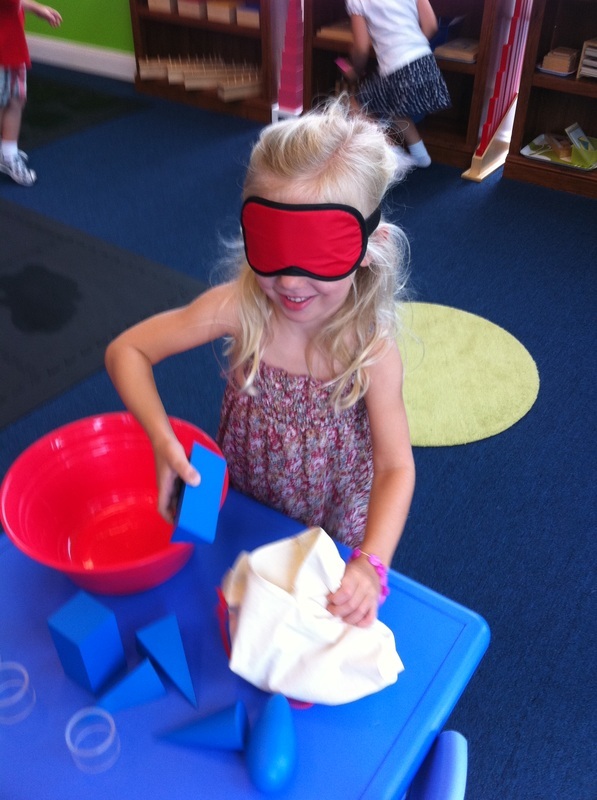 What is the Brilliant Minds Montessori Curriculum? Brilliant Minds has adopted a carefully devised Montessori curriculum which utilizes systematic exposure to sensory, motor, language, cognitive tasks that strengthen intellectual functioning in children ages 2-6. We apply the classic four-tiered Montessori domains of study including Skills of Daily Living, Sensorial, Academic and Cultural/Artistic. Within the daily living skills domain the child is first taught to focus mental attention while working to control his own movements. Activities may include such exercises as maintaining balance, graceful walking, handling materials gently, etc. Additionally, within this domain, basic self-help and room care skills are taught and practiced, such as dressing skills, washing, sweeping, food preparation, exercise, etc. The lessons associated with the daily living skills domain foster development of self-discipline, independence and self-esteem. Additionally, these tasks are designed to strengthen and develop muscle control to be utilized in later educational areas, such as reading and writing. The sensorial materials center on refining the senses (visual, tactile, olfactory, and acoustic). 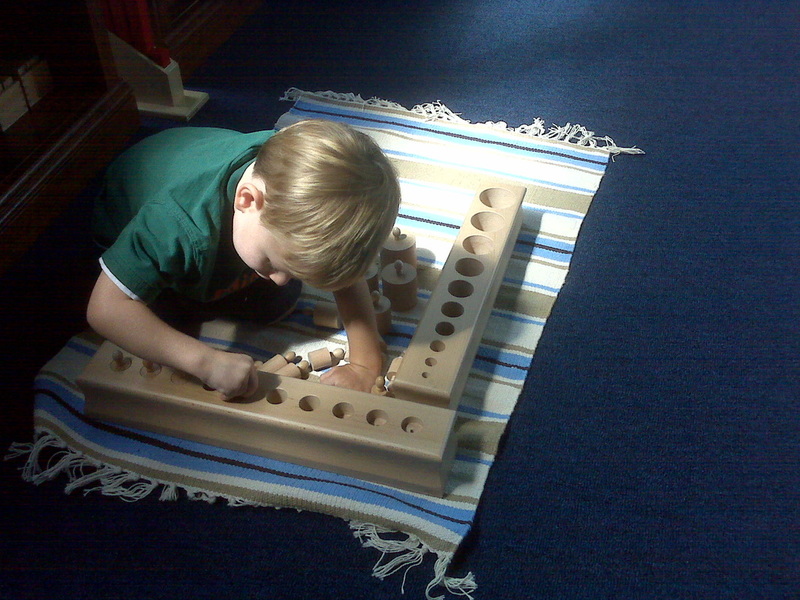 As described earlier, Dr. Montessori developed a set of classroom materials that carefully address the inner needs of the children at the correct time (for more information about the materials, please see the section under “What is the Montessori Method?”). Here, the child is systematically exposed to various stimuli, such as sounds, textures, colors, etc. The child works to enter these experiences into an inner mental order and, in doing so, the child is strengthening intellectual functioning by teaching himself to make comparisons, judgments and utilize the power of reasoning in evaluation of the environment. The academic materials include lessons in the areas of writing, reading, mathematics and science. These areas progress smoothly from the foundation set from exposure to the sensorial materials earlier on. In particular, reading and writing skills have been indirectly developed in the environment from the earliest exposure to the Montessori classroom. The early exposure to Handwriting Preparation, Penmanship, Phonics and Reading facilitates learning habits to last a lifetime. 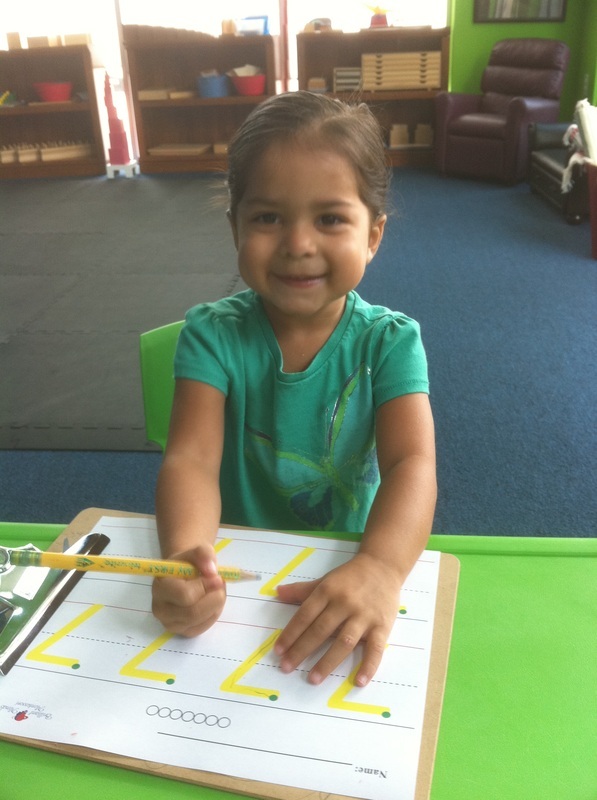 Spatial perception, fine motor development, hand-eye coordination, posture, and pencil grip provide the groundwork for the development of good penmanship skills. Through systematic exposure to increasingly difficult skill levels, these prewriting exercises are designed to prepare children for writing readiness. Once the lower levels of handwriting preparation are mastered, penmanship skills are developed. Here the child is taught the correct way to form letters and numbers between the lines of a page. 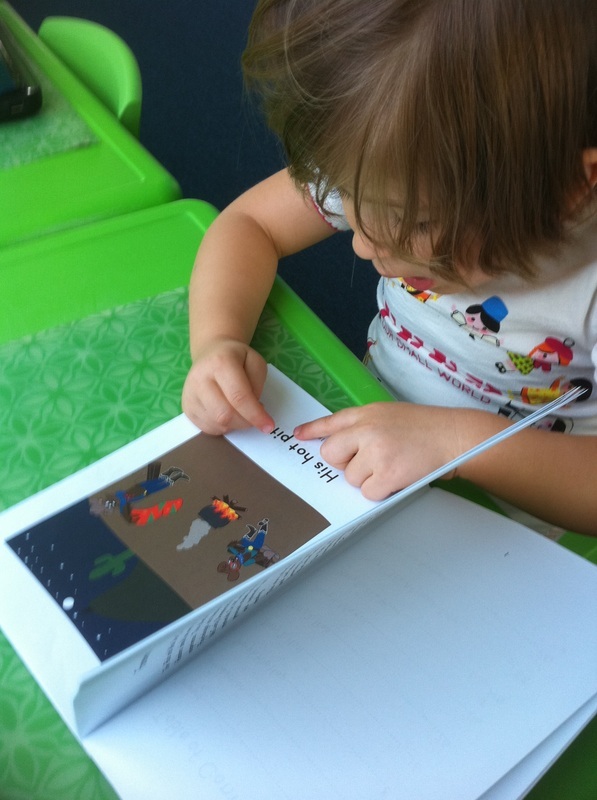 As part of our phonics-based reading program the association between letters and sounds is highlighted. Phonics concepts are taught in a fun and easy way through the use of sandpaper letters, manipulative objects, cards, worksheets and fun games. Once mastery of the symbol-sound correspondence of the alphabet is achieved, reading lessons begin. Reading skills continue to be built and strengthened as the children progress through the material at an individualized pace. Math skills are taught using concrete, perceptually-based materials. These Montessori materials successfully bridge the gap to abstract mathematical concepts and logical thinking in young learners. The children start the study of mathematics by learning the numbers and number symbols one to ten. This is accomplished using the classic Montessori materials/techniques such as the red and blue number rods, sandpaper numerals, association of number rods and numerals, and the spindle box. The children progress to the bead stair and then to the teen bead stair. 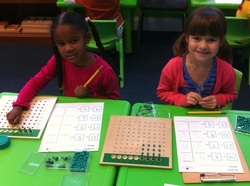 Here they learn to count the bead bars and complete related worksheets. The decimal system is then introduced. Units, tens, hundreds and thousands are represented using specially prepared concrete learning materials that show the decimal hierarchy in three dimensional form: units = single beads, tens = a bar of 10 units, hundreds = 10 ten bars fastened together into a square, thousands = a cube that is ten units long, ten units wide, and ten units high. The children learn to first recognize the quantities, then to form numbers with the beads through 9,999. Reading and writing numerals up to 9,999, and exchanging equivalent quantities of units for tens, tens for hundreds, etc. is taught next. As the children begin to show conceptual understanding of various prerequisite mathematical materials and concepts, they are introduced to Addition, Subtraction, Multiplication and Division procedures. Worksheets and independent study in these areas are encouraged until the children show advanced knowledge of these areas. The scope of the Montessori science curriculum includes an introduction to botany, zoology, chemistry, physics, geology and astronomy. The Montessori approach to science cultivates fascination with the universe and helps to develop a lifelong interest in observing nature and discovering more about the world in which we live. Starting with land, water and air, and progressing to studying the world's different regions through photographs, art, geo-molds, and geography puzzles. The students work with specially designed maps and begin to learn the names of the world's continents, countries, and landforms. Botany lessons assist children in exploring the biological aspects of his environment. The study of botany is child-centered using live plants as a knowledge and interest catalyst. Children learn about animals and their needs, habits and characteristics. 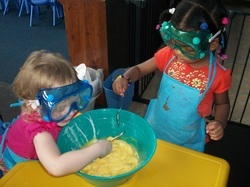 The children participate in science experiments. 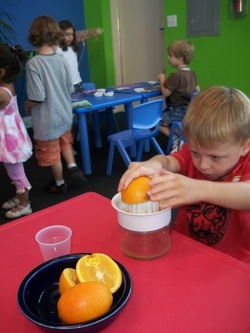 These activities are interesting and fun and are "hands on". Prediction and analysis are incorporated into each experiment. The cultural and artistic materials provide exposure to sculpture, art, music and dance. 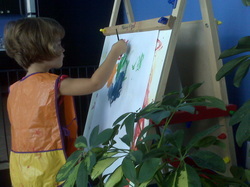 This domain develops skills of self-expression and communication associated with the classic arts. Click here to see our Kindergarten class production of Shakespeare's ﻿Much Ado About Nothing﻿! Or here for our class production of Shakespeare's A Midsummer Night's Dream!